Thread: MMI Hell please help!! Re: MMI Hell please help!! Do you have access to VCDS? Firstly thanks for your reply i really appreciate it, i dont have a vcds but had another person do another scan(costing another £30) no fault codes came up apart from software update management. I dont know what this means? And neither did he, he checked the amp in the back which had a red light coming from the fibre optic cable so he said thats not what the problem is. He said everything runs through this amp i.e phone, nav etc so i dont have a problem with module, which i dont think is right as each system has its own module, but hey hes suppose to be the expert!! So back to square one. After reading through forums with mmi problems im going to buy a optical loop from audi. I have booked the car in with Audi on 17th March for diagnostics (another £60) but going to try and ask for instructions in bypassing each module using the loop using this forum and also where each module is located. (Im not tech savy so gna be like climbing mount everest for me). Mmi starts up ok but then it gets corrupted and freezes then switches off after exactly 4 mins 21 seconds each time, also where the hell is the power coming from if i have switched the engine off and locked up?? Has anyone had problems because of corrupt software?? Could it be as simple as a software update? And plenty threads on other forums how to update system yourself, 40 min for softupdate if you have oldest sw. By your symptoms, worst case could be the hdd is starting to loose its life. 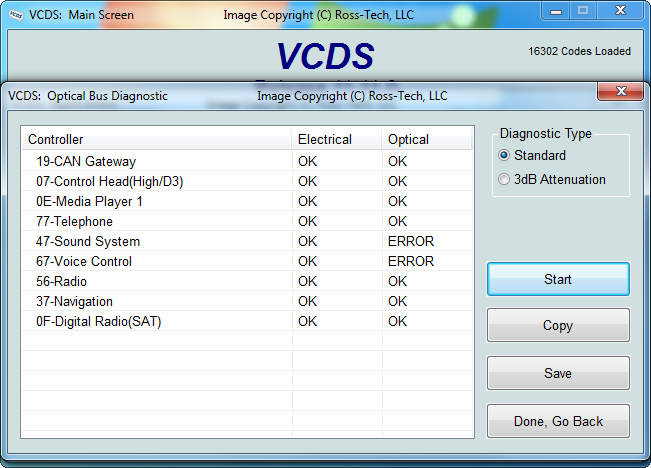 So, perform optical test with vcds, install sw 257_6 and will see what happends next, dealer final result willbe anyway- like you need new mainunit etc, they do not try any alternative! I would say though .................................... that I would perhaps investigate the battery of the car firstly. Its so precise in the time you are giving for it cutting out, that it leads me to think that the car is checking the state of the battery; then shutting systems down that will result in the battery going flat otherwise ......................... or so the car thinks !!! So for a FREE check, google battery testing for free in your area & check to see if you have a dud cell(s) in your battery. Both are "null" sw and nav database? And dont check sw right away when mmi wakes up or starting car, after 3minutes or so, when all modules are fully working! If you have main unit in centre console top of the climate control, you have 3G high or basic, if you have joystick on top of big mmi knob you have 3G high and you need sw hnav257_6 if you have without joystick you have basic and you need bnav260! Thanks for your quick reply, both say null but ill make sure i check this time after 3 minutes and post back, i do have joystick so 3g high i guess. As my mmi automatically shuts off after few minutes will the software update not get interrupted as it can take around 40 mins to complete from what i understand, my mmi will restart ten times in that time! !